I have seen this pattern so many times before. 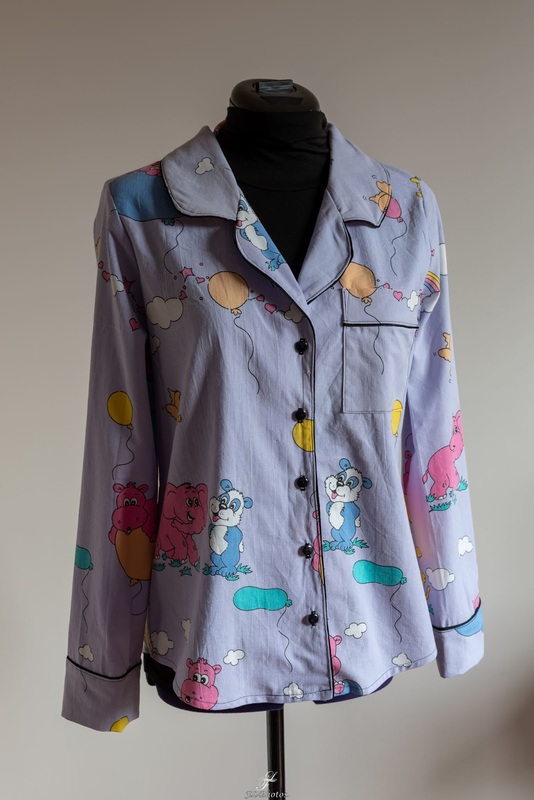 I mean, Carolyn pyjama from Closet Case patterns has become extremely popular (as probably all of their patterns are). However, I was never really tempted by it. First, I do not lounge in pyjamas at home and second, it is never cold enough where I live to justify sewing a proper pari of pyjamas. Of course I have sewn a set of homewear, which I still wear, but I was pretty much ok with the Burda patterns I used. Also, I am not the biggest fan of indie patterns. Till this July when my mum offered me two big bags of old sheets to use as muslin which contained my sister’s favourite sheets – “the hippos” (favourite when she was a kid, just ot be clear). These sheets were kind of mythical in my family, and even if they were sometimes replaced by “the elephants”, “the hippos” were the best. 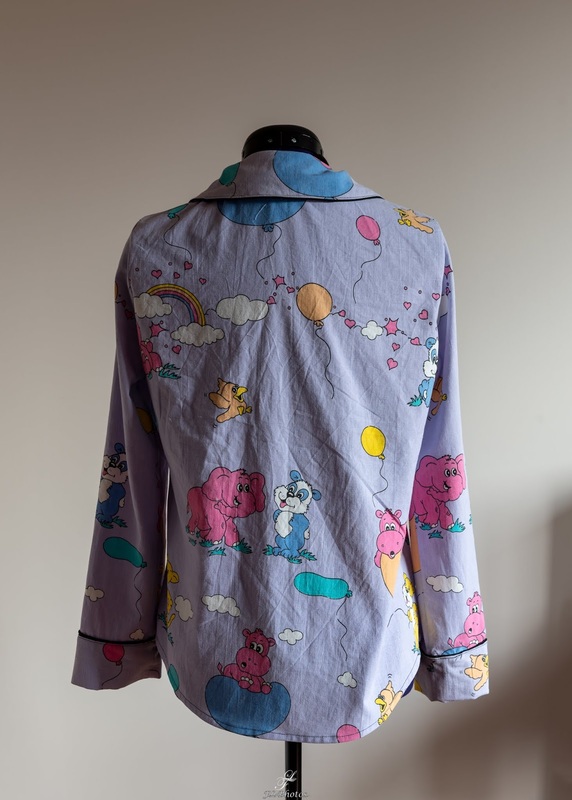 I knew my sister was going to visit me mid-July, so I wanted to surprise her by letting her sleep in “the hippos” one last time, but my dear BF had a much better idea – why not sewing her a pyjama from “the hippos”. Well, challenge accepted! Now I only needed a good pattern and that’s where I immediately thought of Carolyn pyjamas. I bought the pdf and printed it out instantly and could start sewing. Fortunately, my sister is the same size like me, just little thinner, so since I would be between sizes, I chose the smaller one. I shortened the pattern as I would for me in any case and that was it, I just hoped for the best. I had a complete one-person sheet with hippos, so quite enough to sew a top with long sleeves and a pair of shorts (even the long version would be feasible, but I chose this option. The good thing is that the sheet fabric is rather used up, so it is much softer than it used to be. The violet colour is no longer so deep, but it remains kind of nice. I cut out everything without paying too much attention to pattern matching (except for the little pocket) and actually cheated little bit by adding piping. The black piping was actually a great idea since it gives the pyjama kind of a class look – well as long as it is class to have hippos on your garment ;-) For the top I used some sort of faux piping which is not always attached perfectly around the corners, also it was my first time using piping, but it works and looks ok. For the bottoms I created my own piping and that worked actually much better. Lesson learned. I also added contrasting topstitching and black buttons and somehow really like the result. As for the pattern, I was really surprised how little adjustments I had to do so that it fits me (and my sis). Of course, the pattern is supposed to be large, but it was pretty good in the shoulder/collar area, my usual problematic zone. So definitely worth the money, as I quite hope these will not be my only pyjamas sewn. 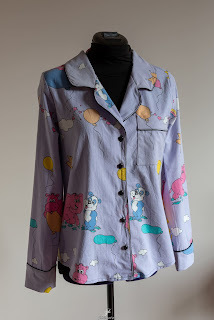 Because now, I would like to sew the pyjamas for me as well, and no, I am not going to use “the elephants”, but rather some nice satin. 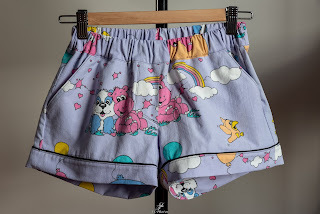 Also, the shorts pattern fits me quite well as well, so maybe some new homewear shorts to put on a to-do list. These are brilliant! And what a great way to use the fabric.